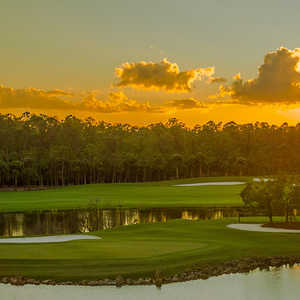 NAPLES, Fla. - Naples Grande Golf Club is certainly aptly named. You could even drop that second e. This course is grand, pure and simple. There's no room for error off the back of most Naples Grande's greens. Rees Jones' old-fashioned parkland layout has those traits golfers used to love but which have largely disappeared from the modern course-design lexicon. Small greens that are treacherous if you miss long. Well-manicured fairways unmarred by looming condos. "The golf course is certainly built with that traditional feeling," Head Professional Ryan Brandenburg said. "You can't go long here, so club selection is so important. It's a real traditional course, with no homes. "That's definitely one of the selling points out here; it lets you play a course that looks like it was built back in the 1950s or 60s." Played from the back tees, the course measures 7,078 yards, a little long for a traditional layout but not so long it will overwhelm the average golfer. Jones, like his renowned dad, provides a variety of risk/reward options but factors in safe routes and bail-out areas for those of us who don't hit it like Tiger. The course plays through mature cypress trees - some of behemoths - and pine, and several fairways are beautifully lined with palms. There's a 30-acre lake dominating one stretch of holes, and a babbling brook designed by a babbling-brook expert named Hugh Hughes. The drainage pipes that connect to a canal that flows into the Gulf of Mexico sometimes bring otters and alligators into the water hazards. 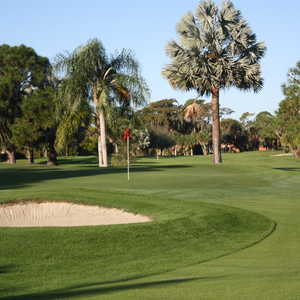 The course has received its share of awards, including a 4½ star rating from Golf Digest and a place in Golf Magazine's list of Florida's top 50 courses. They're well-earned. A number of holes stay with you long after you've walked off the 18th. Nos. 9 and 18 get a lot of mention. The former is a risk/reward par 5 that wraps around a lake to the right. The closer you hit to the water, the better chance you have of reaching in two. A spreading oak that fronts the green comes into play on almost any shot within 120 yards of the green. The 18th is a par 4 with a fairway that pitches to the left toward a lake, with a rock-sided green that drops off sharply to water, one of two such greens on the course. The 11th and 13th are difficult driving holes, the latter being the course's one architectural sore point: The further you are from water, the better angle into the green. Still, this hole proved the hardest for the pros that played here at the South Florida Open. The course is well-treed around the perimeter while the interior is fairly open; the last four holes have something like a links feel to them. The owner, Fort Lauderdale-based Boca Resorts, doesn't seem shy about spending money for improvements like a new, 14,000-square-foot clubhouse overlooking the 18th green. The bunkers were rebuilt in May using a fine, light Caribbean sand, and the greens are top-dressed year-round so that they stay true and relatively fast. 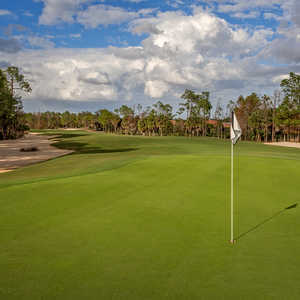 Naples Grande is an excellent resort track that by all indications should keep getting better. The service is what you'd expect from a top-notch facility, and the new clubhouse should launch it into the top sphere of Naples resorts. Naples Grande Resort & Club is a newly redesigned playground looking out over mangrove swamps and gulf waters. The beach is a half-mile away, and shuttles run back and forth. Formerly the Registry Resort & Club, Naples Grande just underwent a multimillion-dollar modernization, and they're not done yet: Plans call for a new spa directly beside the lobby. The Edgewater, a water-hugging sister property a few miles away, is also getting a makeover. The Ritz-Carlton name has long been synonymous with luxury, and its Naples resort at the Tiburon Golf Course lives up the image. A little less formal than in years past, it remains a beautiful resort, from palm-lined entrance to the blue crystal and cut flowers inside. The property recently underwent a $22 million renovation; every room was updated with wood floors in the foyers, flat-screen LCD televisions and sleeper chairs. The pool area has personal cabanas have their own refrigerators and TVs. You're so pampered here you feel guilty. The Naples Grande has a number of restaurants and will soon add the Strip House, serving the likes of Colorado lamb rack, Maine lobster and sesame-crusted tuna. The Lemonia at the Ritz is a Tuscan restaurant where you can eat indoors or on the outside patio that overlooks the Tiburon course. Try the salmon, and save room for dessert. The Ritz also houses the Bella Vista Lobby Lounge, a poolside grill and a coffee shop. Both resorts are convenient to downtown Naples restaurants. The course gets about 80 percent member play and 20 percent resort play.